There is a place on the east coast where golfers can enjoy themselves on championship courses one minute and pristine beaches the next. This place is Myrtle Beach South Carolina and offers award winning golf to thousands of golfers every year. 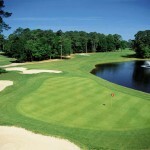 Myrtle Beach golf is a great way to get the most out of your golf trip. The area boasts over 120 championship golf courses that are perfect for all skill levels whether you’re a seasoned veteran or just starting out. Many residents and visitors love Myrtle Beach golf because they can play some of the nicest courses in the country without burning a hole in their pocket. They are very affordable and there isn’t a huge wait list to play like other coastal golf areas. You and your friends can play courses that were designed buy professionals such as Love, Nicklaus, Daly, and more! Come enjoy this premiere golf destination, you won’t be disappointed.